Last week, I wrote that I had stopped bathing my dogs. But before that, I tried various shampoo alternatives. Be sure to ask your vet before trying any of the ideas listed below. Year ago when I didn't mind perfumey things (I don't use fragrances now), I brushed baby powder through my dog's fur. Pet parents can also try corn starch or baking soda. I mentioned my late senior dog in my previous post on baths. When the water spray stream became painful for him, I tried baking soda and water. I also tried a lemon tonic. I made the tonic, added water and poured it over him. When he dried, his fur was shiny and soft. Another thing I tried on all the dogs was oatmeal. There are colloidal oatmeal products that are made specifically for the skin. But I used regular oatmeal. I ground it into a power using a blender, wet my dogs, then rubbed it into their fur vigorously. 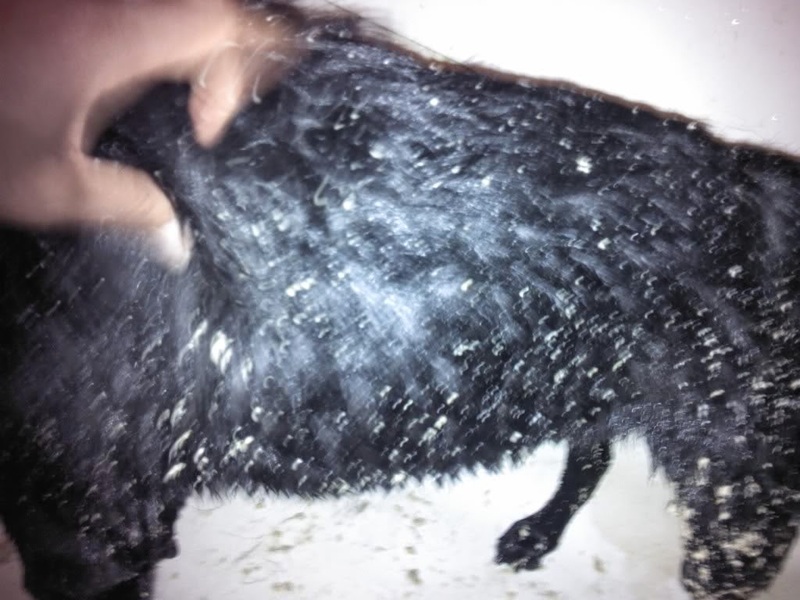 It rinsed out of their fur quite easily, but left a gooey mess in the bathtub. About a year later, I was having some issue with eczema (myself, not my dogs). My brother suggested a sugar scrub that he saw on Good Morning America. It felt great on my skin so I decided to try it on my dogs as well. I just poured some raw sugar into a bowl, squeezed the juice of some lemons on top, grabbed a hunk and rubbed my dogs with it. It rinsed easily off my dogs and out of the tub. Or course I had to make sure they didn't try to lick the sugar. I was worried that the lemon would bleach Murphy's pretty black fur, but it didn't. Of course this might be different for other dogs. So be sure to test this mixture in a inconspicuous spot first. And of course just plain water can wash away dirt. But as I mentioned in my last post on this subject, For now, I'm just brushing and combing my dogs often. Pet parents who like shampoos but also like to wash their dogs often might consider alternating between a plain water rinse and a sudsing - to help reduce the drying affect of excessive shampooing. Stay tuned. We will talk about some ways to help our pups feel better about baths.